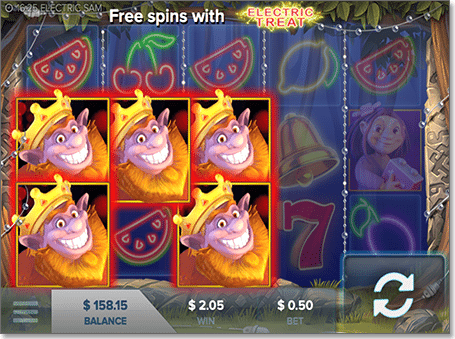 If you have lost that electrifying feeling when playing pokies online, ELK Studios want to shock you back to life with their new offering, Electric Sam. While the theme is quite confusing – a mixture of fantasy characters which appear to be trolls and delicious fruits such as watermelons, plums and cherries – this pokies game is strangely intriguing. It features a troll named Electric Sam and it appears he has started his own casino with what we can only assume to be his wife and daughter, Electric Sandra and Electric Maggie, respectively. They are located in a forest, with trees surround the slots. The strangest thing is the unusual pairing of electricity and trolls, which rarely cross paths even in fantasy novels. The audio on Electric Sam is minimal, which may appeal to those who don’t enjoy slots noise. ELK Studios was founded in 2012 and have released four previous video slots. However, as we can see from this offering, they are unique and worth taking a look at. This slot is available via desktop and on smartphones and tablets. This five-reel online pokie offers the same possible winning combinations as our favourite 243 Ways Game of Thrones slots, which means you can win by matching symbols in any adjacent reels from left to right. But their similarities stop there. Filled with neon fruits to coincide with the electric theme it all seems quite a novelty, and therefore may be good for novice pokies players. However, players shouldn’t be fooled as they offer many freebies, and chances for players to win. The main symbols are the neon fruit signs, the red sevens and the troll characters. The bell symbols are what triggers free spins. Hitting three bells will score you five spins, four bells will score you 10 spins, while five bells will score you 15 spins. If you land more free spins throughout the free turns, they will just be added to your account. For example, if you start off with something like five or 10 spins, you could easily end up getting around 15 or 20 during the use of the initial free spins. It can be quite difficult to win big unless you are on a hot streak. The following features help with the winning streak and give you the chance to potentially make some money. To get a sticky wild, land on three of the Electric Sam character symbols, while getting three of the Electric Sandra characters will see a multiple in place of up to 10x, however, the most we got when we played was 2x. This could be different for you. Spin three of the Electric Maggie symbols and she will blow up all the fruit symbols and replace them with new ones, increasing your chance of winning. To get the main feature land the ‘Electric Sam’ logo and a gold bell. From a minimum of 20c per spin to a maximum of $100 per spin, this online pokie offers numerous ways to win, and a fun way to get wilds, or the feature. Electric Sam is optimised to suit portable devices so you can be electrified while waiting in any boring line, sitting on the bus or taking a coffee break. The mobile version looks exactly as it does on your desktop only smaller, with touch-screen capabilities, and the pay-table is the same. It might be a little slower accessing it via your portable device, however, it should not be that much of a difference. Be careful not to tap the back buttons during play either. If you do find that a problem or if you really enjoy this game you can add it to your home screen, via a web app created by your browsers settings, and access it quickly and easily. While we can’t quite figure out why a troll would want to start his own casino in a forest, or even where he got the electricity from, we do enjoy the amount of ways we can win and all the free spins. This game is quite light and entertaining and has a hilarious theme, so it might be best for the beginner. Where can I play Electric Sam online? Some of our preferred online casinos offer games by ELK Studios. These include G’day Casino, where you get a 100% matched deposit bonus when playing for real money, and Slots Million, which offers a $100 first deposit bonus as well as 100 free spins on selected slot games.